Professional resume writers use many tricks of the trade to put more information in a resume without making it seem packed to the rafters. To the amateur, this can be overwhelming. So unless you have a background in design, stick to these easy suggestions. Whether you are using a paragraph for your summary section or the opening hook paragraphs of your job descriptions, avoid long, blocky content. A good paragraph on a resume is two to four sentences and no more than approximately five lines of text. If you must say more, break it down into two paragraphs or a paragraph with supporting bullets. After you’ve written your overview hook paragraph for a job description, it’s time to include the supporting CAR story (Challenge, Action, and Results) bullets. Too many bullets in a row leave the reader skipping and jumping, likely to miss what could be most important. 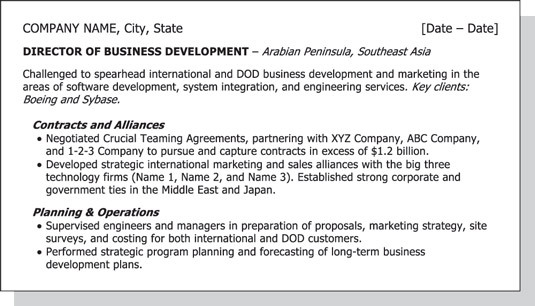 This snapshot shows a before resume that is too blocky and dense. To avoid this, break up your bullets. One way to do this is to insert a little space in between each bullet. 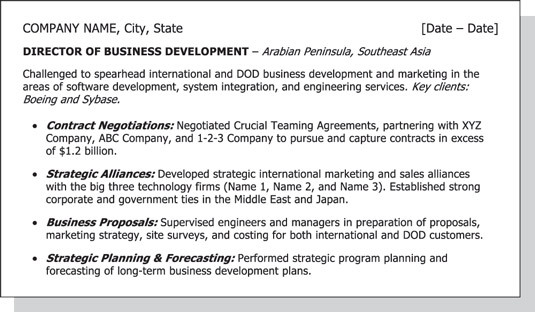 This snapshot shows an after resume that employs bullet titles to draw the eye. However, you also want to draw the eye, which can be done either by putting titles in front of each of your bullets or by breaking the bullets down into categories. 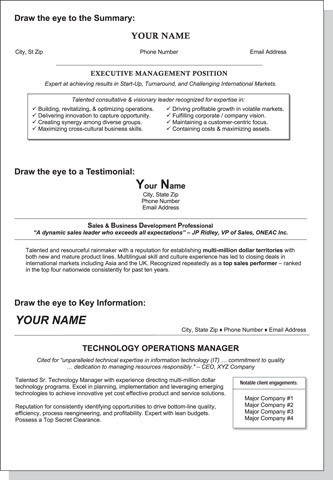 This snapshot shows an after resume that employs functional sections to draw the eye and break up content. You can use text boxes to draw the eye to something impressive like an award, special accomplishment, or testimonial. They also work well if you want to set a snapshot or fact out to the right of your text. Text boxes featuring the summary, a testimonial, and key information grab the eye. Be careful not to overuse this technique in your resume. Use these formatting techniques only once or twice to really hook the reader into reading the most important information, which will inspire them to read on. Although it’s a good idea to spell out accomplishments in the body of the resume, make it pop with a chart or graph to draw the eye. A very simple chart can depict a key metric, such as cost savings. You can use these techniques anywhere within the resume, but do so sparingly to avoid clutter. They aren’t just limited to the summary. Consider including one wherever it helps showcase valuable information. Color should be used carefully and sparingly in a resume. If you use it, limit it to header text and/or bullets. Stick to one color throughout the resume and aim for rich and appropriate. Steer away from brights, neons, and pastels. This snapshot shows a variety of header options you might employ. Use two different fonts in your resume. This is typically using a serif font typeface for your headers (like Times New Roman or Garamond) and a cleaner, simpler sans serif font for the body text (like Arial, Calibri, Tahoma, or Verdana). Take advantage of bold and italic. When used sparingly, bold and italic draw the eye to key information such as job titles and accomplishments. Vary font sizes. A simple way to make content stand out is to increase the font size. This can be a good technique for drawing the eye to a job title, company name, or header title. Mix differently spaced tabs and indentations. Make a habit of mixing bullet styles without thought. You can mix bullets and checkmarks if the result is tasteful and doesn’t look cluttered. Use different spacing between lines. 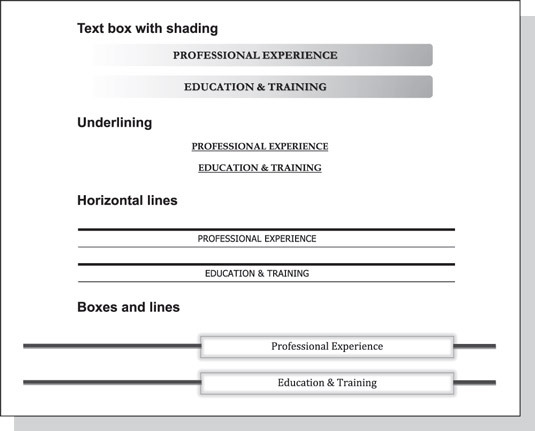 Keep your line spaces the same between headings and the body text for each data point. You’re going for a finished look, which means no careless placement of content. Your name and contact information can be flush left, centered, or flush right. Typos and spelling errors are attention killers and job opportunity killers. They come across as careless or unprofessional. Use your computer’s spell-check feature, read your finished resume carefully, and ask a friend who is a good proofreader to read it a couple of times. Watch out for widows and orphans in your text. Never leave just one or two short words on a line by themselves or one or two sentences from a job description on a page by itself. To minimize the risk of a page becoming an orphan, put a simple heading or footer atop each page after the first with your name and page number. In a multiple-page resume, you may want to indicate the total number of pages (for example, Page 1 of 2). Avoid underlining text in the body of the resume because it can hinder scannability.